Helping our customers meet their financial needs is important to us. Before you leave, please take a moment to answer these 4 simple questions. 2. Did this website provide the information you needed? 3. 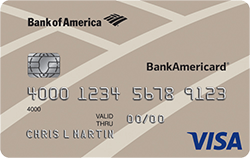 Do you plan to apply for a Bank of America credit card in the near future? 4. What, if anything, would you suggest Bank of America change about this website? To protect your identity, please do not submit personal or account information. Note that we cannot reply to questions asked via this form. Please contact us directly if you have any account or service related issues. By submitting your feedback, you agree Bank of America, its affiliates and any authorized parties may use, commercialize or reproduce the feedback without restriction or any compensation to you. Your responses will help us improve the Bank of America digital experience for all our customers. We're sorry, this page is temporarily unavailable. We apologize for the inconvenience. One or more of the cards you chose to compare are not serviced in English. 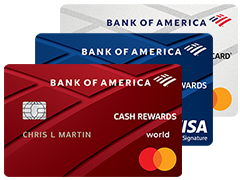 When you enroll in the Preferred Rewards program, you can get a 25% or more rewards bonus on all eligible Bank of America® credit cards. Plus, as a Preferred Rewards client, you’ll get even more benefits and rewards with your every day banking. As your qualifying Bank of America® deposit accounts and/or Merrill Edge® and Merrill Lynch® investment balances grow, so do your benefits. Tell us who you are and what you like, to see what offers are available to you. It will only take a minute and won’t impact your credit score. Already a Bank of America customer? Be sure to sign in when you check for offers to see what’s already waiting for you. Choosing a credit card can be overwhelming. We’ve compiled some important considerations to help you pick the best credit card for you. Get the most out of your credit card. Find out how you can take advantage of all the opportunities that may be available to you as a cardholder. By following a few simple steps, you can help ensure you’re headed in the right direction when it comes to managing your credit card debt. Better credit habits can lead to a better credit score. If you’re looking to improve your credit, check out some of our helpful tips.